This is a monument to the women dealers in the Coal Quay, Cork City Open Market. It was erected on February 27th 1986 and unveiled on February 28th 1986 by the Lord Mayor, Alderman Dan Wallace TD as a gift to the City of Cork to commemorate Cork 800 by Sunbeam Wolsey PLC. 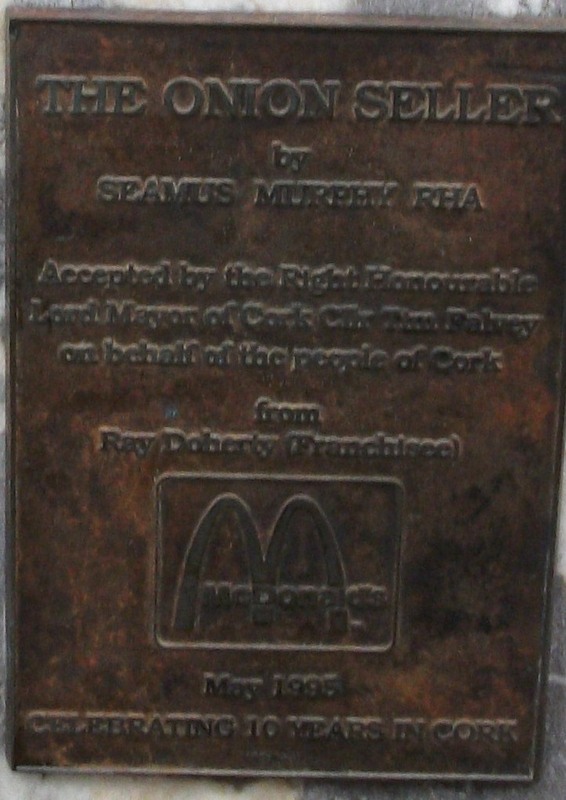 Séamus Murphy was born at Greenhill, Burnfort, Mallow, Co Cork. This entry was posted in Ireland, Photography, Sculpture and tagged Cork City, Ireland, Photography, Sculpture, Séamus Murphy, Sunbeam Wolsey PLC on September 29, 2013 by Grannymar. I didn’t go quite that near, I had to get back in time for the bus to take me to the train station for my return home. Lovely work of art. You show the best pictures! I had hoped to gather some more during my couple of days in Dublin, but fate intervened, curtailed my movements and extended my stay. Some women had very difficult lives back in the day and it is good that their toil is recognised. Photographing these sculptures are a learning experience for me, They give me an opportunity to research the background to the piece and the sculptor. Great that they immortalized the onion seller. Looks as if her head and hands are disproportionate to her body… maybe that’s just my perception. Brighid, perhaps it has something to do with my angle of the shot or my poor photography skills. Does she have a nickname like a lot of the Dublin statues do? She hasn’t many onions. She couldn’t have made much money out of those. Or maybe she has a little stockpile somewhere in the vicinity? Nick, she looks tired, maybe that was all she had left unsold at the end of the day.